1. Boil ox pata and tail; discard water. Boil again in water together with wine, peppercorns, bay leaves, thyme and onion. Simmer until tender. Strain broth and save. Cut deboned pata and tail into 1 piece; set aside. 2. Heat olive oil in pan; sauté garlic and onion. Add chorizo ox pata and tail; cook for 5 minutes. Add tomato sauce, salt pepper and paprika. Add ½ of reserved broth and stir until mixture thickens. Simmer uncovered for 30 minutes; lastly, add garbanzos, pimiento and green olives. Add more broth as necessary (must be thick) and correct seasoning. This dish is a good appetizer, so delicious and easy to prepare. 1. 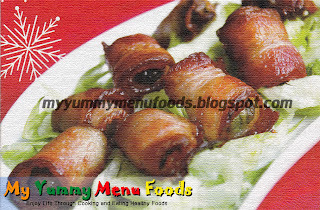 Wrap pieces of bacon around well- seasoned oysters. 2. Deep fry until bacon is crisp. 3. Serve with salad greens. 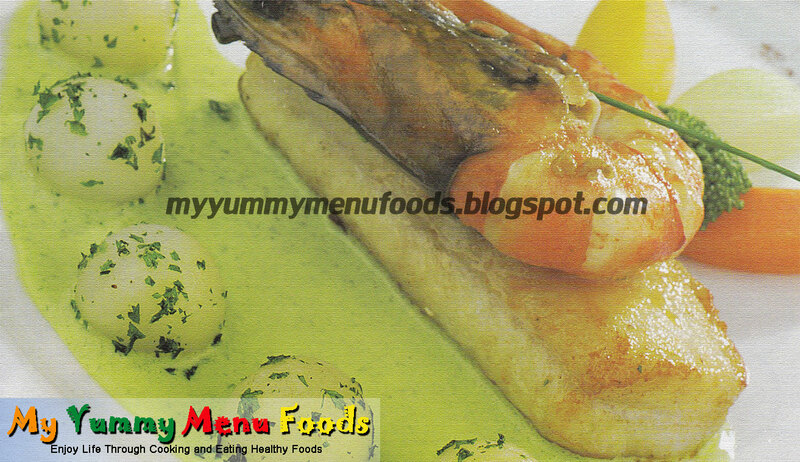 This delicious fish stuffing with shrimp makes the recipe special and easy to cook. Just sauté the ingredients and steam for 5-6 minutes. You’ll gonna be enjoy eating your special dinner dish. Sauté onion. Add garlic until half cooked. Add crab fat. Stir in a minute. Add cream until little thick then season with salt and pepper. Season fish fillet with salt and pepper. Wrap the shrimp with the fillet. Arrange it inside the bamboo steamer. Serve with the crab fat drizzled around the dish. 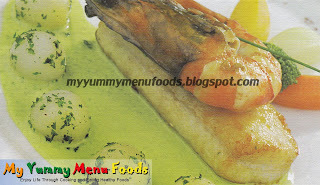 Cream dory is similar to catfish. This is exciting dish because this meal has covered protein to veggies. Season the fish and prawns. In shallow frying pan, heat the oil and sear the seafood. Sauté the onion until translucent. Add the parsley and let it cook for 1 minute. Deglaze with white wine and reduce. Add the stock and boil for two minutes. Add the fresh cream and boil again for 1minute. Pour a mixture in a blender and mix until the sauce is fine and smooth. Return to the stove and finish with a small amount of soft butter. Cut the vegetables and potato into the specified shape. Boil and sauté the vegetables in butter. Arrange in the center of the plate the seafood. Garnish with the vegetables and potato. Drizzle with the sauce around the plate and garnish with herbs or fried basil. This is the perfect dinner dish because it has a very tender cut and full of flavor. Season and grill the lamb until medium done. Set aside. Sauté the shallots and add the red wine. Reduce until 10% is left. Add the demi-glaze and cook for 5 minutes. Season and finish with soft butter. Using a mandolin, slice criss-cross the potato and wash with cold water to take away the starch. Soak for a little while in cold water and deep fry in clean oil. Boil the potato and the pumpkin together until soft, then mash. Add the milk and season. Mix well and finish with soft butter. In a shallow pan sauté the onions, eggplant and garlic until the eggplant is soft. Add the tomatoes and season with salt and pepper and cumin. Finish by adding chopped parsley and set aside. Arrange the lamb in the center of the plate and make 1 quenelle of the mashed pumpkin. Arrange the potato crisps on the top of pumpkin mash. Using a 2 inch ring scale, place the eggplant mixture in the center of the plate. Drizzle with shallot sauce and serve hot.